We just released LetMeTalk 1.3.19 for Android. LetMeTalk now supports text within the sentencebar, Kantonese and because of some optimizations we managed to bring down the download size by some megabytes! You can now enable / disable that the words of the images are shown in the sentence bar. This might be helpful in several situations. We enabled this feature by default, bu5 if you do not like it or you need the screen real estate on small devices like mobile phones, you can of course disable it in the settings. LetMeTalk now supports Cantonese, a version of chinese mostly spoken in the Hong Kong region. This is only the first step of our cantonese support. In this step we make it possible to use the Google Text to Speech engine, which should provide a pretty good experience and is most likely already installed on your device. In the next step we will replace some chinese words with cantonese words, so it should feel even more natural. If all pre-conditions are met, you only need to go to the LetMeTalk Settings and select "Choose Language -> Cantonese". Now the Menus should be in chinese and the speech engine uses cantonese voice. The Google Text to Speech Engine is the default on most devices, so you have a good chance that it is already installed! Go to the LetMeTalk Settings and choose "Download additional voice files". 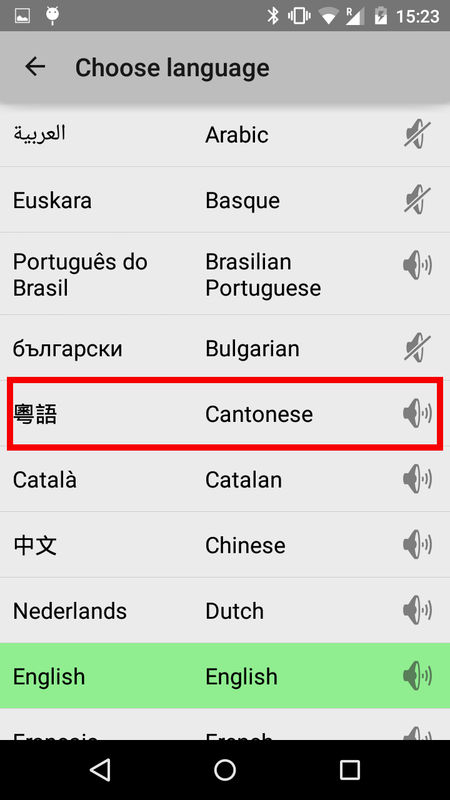 Here you should now be able to select Cantonese. Select it and make sure you have a voice file installed. If it is installed, you have a trash can beside it. If you can NOT select Cantonese, you have an older version of the speech engine installed. In this case go to the Google Playstore and search for "Google Text to speech" and update. Maybe you have to remove and re-install the Engine. Now it should be possible to choose Cantonese and it should "just work". Because of some changes we were able to activate some compression again, which reduced the APK size from 89 MBytes to 82 Mbytes, despite offering a new language. It is the really very good update of the letmetalk app that now it will be Google Text to Speech Engine and Size Optimizations is the best new features according to me also can visit https://babasupport.org/windows/fix-windows-10-error-code-0x8024a105/ for more information in details. Thank you so much for the making a easy way for us because here http://mycomputerwindows10.com we can read more new things for the all and now see here for the all. Thank you very much for supporting Cantonese!!! I am a Hong Kong user as well. May I know any ways to display Traditional Chinese words instead of Simplified Chinese?